Beto urges attendees to register to vote before the Texas deadline, October 9. On a breezy Saturday evening, roughly 55,000 people packed into Auditorium Shores for the Turn Out For Texas rally. Attendees showed their support for U.S. Senate candidate Beto O'Rourke and jammed along with Willie Nelson, Leon Bridges and more. While thousands had gathered at the Turn Out For Texas event to hear from the guest of honor, a few had their mind set on the lively performers scheduled as well. Patrons of the event decorated themselves head to toe in “Beto” merchandise on September 29, all excited to not only hear from O’Rourke, but also to enjoy the donation-based performances from Willie Nelson, Leon Bridges, Lukas and Micah Nelson, Carrie Rodriguez, Tameca Jones and Joe Ely. After a kickstart to the evening from mayor Steve Adler, country-rock singer-songwriter Joe Ely took the stage. The first song of his set was a cover of “Borderless Love” from The Flatlanders’ 2009 album, Hills and Valleys. The combination of the songs’ playful yet patriotic undertones mixed with the crowds’ unmistakable energy meant Ely had chosen the perfect piece to rouse some excitement from the attendees. The next performer carried on Ely’s enthusiasm, but in a different fashion. Local artist Carrie Rodriguez captured the audience's attention right away with just the stroke of her fiddle and captivatingly smooth vocals. The TOFT rally had catered to all types of audiences, encompassing a wide range that varied from honky-tonk to guacha-influenced country. Every attendee there had a little something in store for them and the Tejano country fans in attendance demonstrated their appreciation by the way they swayed in harmony to Rodriguez’s music, completely mesmerized by the ranchera-inspired originals. Queen of Austin soul, Tameca Jones, stole the stage next with her powerful yet suave vocals. She chose an instant crowd pleaser by performing Elton John’s 1974 single “Benny and the Jets,” prompting every individual to sing along. However, the hit covers did not stop there. Jones wrapped up her performance with The Beatles’ “With a Little Help from my Friends”. Concert attendees slipped into group side hugs, swaying side to side. Texas native, Leon Bridges opens the set with “Smooth Sailing”. During an interview with concert attendee, Noelle Simon, she talked about her experience at the rally and expressed gratitude to the city that made it all possible. “I’m discovering new artists, making new friends, and I get to see and hear from Beto himself. This is why I love Austin,” said Simon. The final act before the headliners was maestro of blues, Leon Bridges. From the second he stepped on the stage to the moment he took off, Bridges had the crowd wrapped around his finger. He opened with his feel-good, slow burning track “Smooth Sailin’” from his 2015 album Coming Home, egging his audience to shimmy along with him. He went on to include some of his newer content, performing “Bad Bad News” and “Beyond” from 2018 album Good Thing. 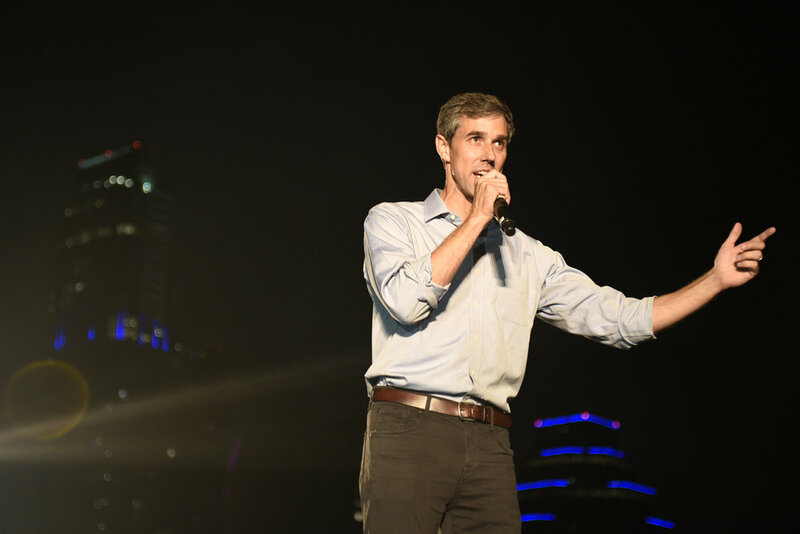 Right before signing off with his Grammy award-winning track “River,” Bridges reminded the audience of why they had all gathered tonight and commenced a chant in honor of O’Rourke, erupting a sea of “Viva Beto” signs and passionate chanting of the candidate’s name from virtually every attendee. Willie Nelson opens his set with Whiskey River. With this warm welcome, O’Rourke could not help but steal the spotlight as he walked up to the microphone to speak. The Senate nominee thanked the audience for its attendance and urged supporters to “send a message to the future” by registering to vote before the deadline of October 9 in order to participate in the November election. Attendees of the event were lively all evening, but their excitement peaked when O’Rourke signaled Willie Nelson on stage. Nelson began his set with his concert staple “Whiskey River” from 1973 album Shotgun Willie, then continued to include all-time hits including “On the Road Again,” “Roll Me Up and Smoke Me When I Die,” and “It’s All Going to Pot”. Although, the crowd favorite seemed to be a medley of Nelson’s reputable “I’ll Fly Away” mashed with a cover of Johnny Cash’s rockabilly “Will the Circle Be Unbroken”. Luckily, however, Nelson had saved the best for last, debuting a new song titled “Vote ‘Em Out” to mark the memorable occasion. In this new piece he sings, “If you don’t like who’s in there, vote 'em out/That’s what election day is all about.” Lyrics that reign more relevant now than ever, considering O’Rourke is challenging Republican incumbent Ted Cruz this upcoming election, who has served as Texas’ representative in the Senate since 2012. The rally held a noteworthy turnout, allowing individuals of all demographics to come together for a shared cause and in some cases, like for University of Texas at Austin student Bella Cano, restored their faith in politics. During an interview with Cano, she talked about the significant role O’Rourke has played in her changing opinion of politics this past year.